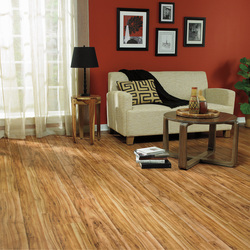 Enjoy the natural looks and timeless style of a beautiful hardwood floor or tile floor - but with the ease of installation and durability found only in Columbia laminate wood flooring and Columbia laminate tile flooring. We've taken design cues from our Columbia hardwood flooring collection and translated the rich colors and unique textures into authentic wood styles for your home. Plus, our laminate tile floors give you the realistic appearance of slate, stone and ceramic without the hassles of grout. Our attention to detail shows through with realistic-looking woodgrain patterns, character marks and surface textures that feel perfect underfoot. Whether you'd like contemporary flair, or want a more traditional feel, Columbia Flooring has just the right laminate wood floor or laminate tile floor. design elements - including a gloss finish or slim plank laminate wood floor widths. And our Traditional Designs deliver high performance, unmatched value and an ageless hardwood appearance. Tile floors offer unmatched style and have become a popular choice for homeowners. Columbia Flooring's Tile Designs provide you with durable laminate tile flooring looks that will instantly infuse your home with contemporary and authentic beauty. Available in natural slate, stone and ceramic looks, these laminate tile floors click together easily - without the mess of grout!